Deep in our souls there’s a longing for God. Often it’s almost silenced by the busyness of our days. But it’s there. A quiet aching, an unrelenting desire. A soul craving that only God can satisfy. 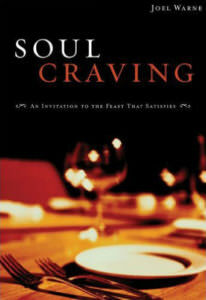 Soul Craving is an invitation to feast on true spiritual food—essential practices and postures of the heart that help us develop loving intimacy with God and satisfy our longing for him. With humor, stories, anecdotes, and classic Christian wisdom, author Joel Warne encourages you to take your place at the feast! So come to the feast!! There’s a place spread just for you! This wonderful resource offers both at-home and group interactive Bible meditations for each session of the Soul Craving class or small groups, group discussion questions, room for journaling and notes, and a variety of spiritual formation activities and resources. Leader notes are conveniently included in the guide. The new Soul Craving 6-session Discussion Guide is a perfect way to guide your class or small group toward rich and transforming things in Christ. For classroom, small group or personal use. The 13 Session Scripture Devotional offers questions for pondering the Soul Craving readings, reflective/interactive Bible meditations for each of the 13 small group or class sessions, room for journaling and notes, and a variety of spiritual formation activities and resources. This guide provides full outlines for each Soul Craving small group or class session including handouts, formation activities, reflective readings, group Bible meditations, class tips, new leader guidance and much more. Author Joel Warne is a student of the soul and a gentle companion on the Way of Jesus. Soul Craving can help anyone know and love God more deeply. I rarely encounter writing like this that speaks so directly and helpfully to my journey with God. I’ve learned more about Christian living and intimacy with God through my Soul Craving small group than all of my other retreats and Bible studies put together. This is the most meaningful material I’ve ever used devotionally. It’s like I can’t stop finding ways of telling people about your book. God keeps bringing people my way who need it. Thank you for your part in my spiritual journey and in the lives of people in our church! Soul Craving is wise and fresh and right on the mark. It whispers strength into my soul. I’m telling you I can’t get past chapter three. There are so many things to ponder I just keep going over and over it! Engaging readings help group members cultivate the outward disciplines and inner postures of the heart that lead to an intimate experience of God. Highly interactive Scripture reflections between sessions help members make connections between the chapter themes and daily life. Practical activities focus on daily moments (driving the car, walking to the mailbox, doing projects at work, fixing meals, reading the newspaper) as arenas in which to experience intimate interaction with God. Identifying and sharing a sense of God’s personal call through the readings, Bible reflections and formation activities keeps things authentic. Shared stories of each member’s personal journey with God deepens trust and strengthens bonds between members. Encounters with God during the group sessions through the biblical texts and worship times deepens confidence to commune with God personally in daily life. A group covenant touches upon expectations for the group environment – safety to share openly, confidentiality, lesson preparation, attendance, positive contribution to the group, and more. The materials mine the wisdom and Christ-centered experience of the group as a key resource, creating a wonderful, Spirit-inspired group dynamic. This results in long-term, supportive relationships that last long after the formal group is over. A facilitator’s guide with handouts, spiritual formation activities, reflective readings, group Bible meditations and much more is included in the curriculum.